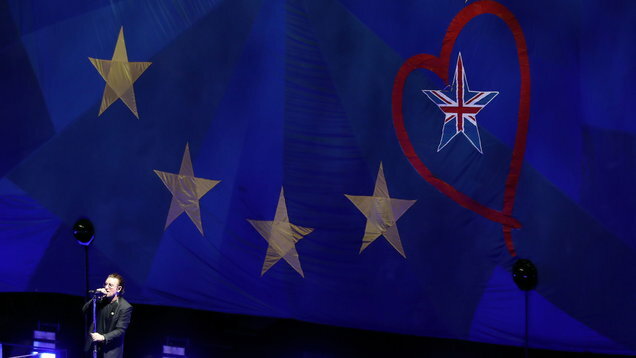 The U2 singer stood in front of a huge EU-style flag and hailed London as 'still a great European city'. Bono has declared Europe’s love for the UK and described Brexit as “a loss of shared dreams” as U2’s tour arrived in London. The Irish rockers thrilled fans at The O2 on Tuesday night in a concert decked out with dazzling technology. Frontman Bono, joined by Adam Clayton, Larry Mullen Jr and The Edge, played for more than two hours and performed tracks from their latest album, as well as crowd-pleasing hits Vertigo, Elevation and Beautiful Day. The European leg of the tour has seen the band reflect on and celebrate Europe, and the London show was no different. Bono talked about their “love affair with great cities, great European cities”, mentioning London, Manchester, Amsterdam, Berlin and Madrid. The singer stood in front of a huge EU-style flag with yellow stars and hailed London as “still a great European city”. One star was not yellow but instead filled in with the Union flag and circled with a heart. During the encore, Bono said: “We’ve just been touring all across Europe and whatever you think about it, all we heard about from Madrid to Berlin to Paris to Amsterdam is that people love the UK. “They love you. And no-one wants you to leave. And that’s just the truth. “For us it’s more than just a gold star falling off a blue flag. “It’s a loss of shared dreams, shared strengths. The set featured a screen known as The Barricage running for around 30 metres through the middle of the arena. Running from one end of the venue to another, the versatile Barricage screen transmitted footage, carried political slogans, showed an animation and beamed images of world leaders into the arena. The crowd’s first glimpse of the band was when they appeared inside the screen and performed the first song of the night. The opening of the show featured a clip from The Great Dictator, the American political satire feature film written and directed by and starring Charlie Chaplin. Original archive footage of European cities captured between 1926 and 1946 was also part of the opening. The star referred to his band as “four Irish boys” and “the greatest rock and roll band on the north side of Dublin”. The show included a video in support of the ONE Campaign’s Poverty Is Sexist campaign which features a chorus of female voices singing Women Of The World. The eXPERIENCE + iNNOCENCE tour follows the recent release of U2’s 14th studio album Songs Of Experience and sees the band return indoors to pick up where 2015’s iNNOCENCE + eXPERIENCE tour left off. By the time the band reach Dublin for four home town shows in November, the current tour will have played to almost one million fans in 30 cities across North America and Europe.